Most of the time, we’re not big fans of remakes. But once in a while, a remake comes along that vastly outshines its inspiration. Invasion of the Body Snatchers, the 1978 reboot of the 1956 sci-fi thriller, is one of those remakes. Not only that, it’s maybe the best remake ever made, and with stars like Donald Sutherland, Jeff Goldblum, and Leonard Nimoy, it’s not hard to see why. 1 - “Total Solar Eclipse” Collectible First Day Issue Stamp - Straight from the USPS this is the official commemorative first day issue stamp. 1 - Comet USB Charging Bank - Do you want to snap a selfie and oh no, you only have 10% power left? Fear not, Comet has you covered. This awesome charger is the perfect save for any emergency situation! 1 - Comet Embroidered Hat - An official Comet TV hat is perfect for any ensamble. It will protect you from the sun, while you look more stylish and awesome than you already are! 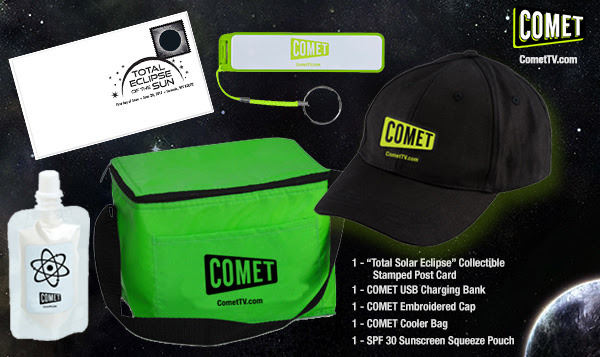 1 - Comet Cooler Bag - This fun portable travel cooler is the go-to gear for your sodas, snacks and anything else you want to put it in. Take it to the park when you’re about to watch the eclipse and let your beverages stall chill and frosty, just like you! 1 - Limited Edition Comet SPF 30 Sunscreen Squeeze Pouch - We can’t let you get toasty out in the sun! This limited edition SPF 30 sunscreen pouch can go in your travel bag and let you avoid a nasty burn! I'm all set for this Solar Eclipse here in NYC! The aliens will take this time to land in the areas where its dark and while everyone is watching the eclipse, not their monitors. For osme , it will be like a blackout. More people will spread political propaganda...probably blaming the President for the momentary darkness. A great darkness will fall across the land. Oh wait, that's already happened. The Appocolypse. Find the X-Men! The world goes dark and all the evil is wiped out! 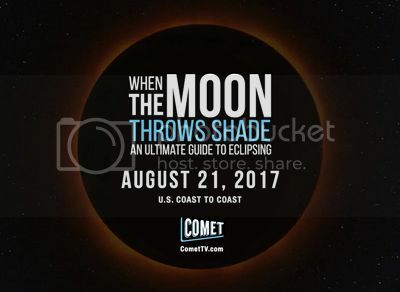 Just what I thought would happen: People converged in areas where the eclipse could be seen in totality to enjoy this fabulous opportunity to enjoy a cosmic coincidence of size and distance. I loved it! !